This dazzling space wallpaper of the Antennae Galaxies shows obvious signs of chaos. Clouds of gas are seen in bright pink and red, surrounding the bright flashes of blue star-forming regions — some of which are partially obscured by dark patches of dust. This dazzling space wallpaper of the Antennae Galaxies shows obvious signs of chaos. Clouds of gas are seen in bright pink and red, surrounding the bright flashes of blue star-forming regions — some of which are partially obscured by dark patches of dust. 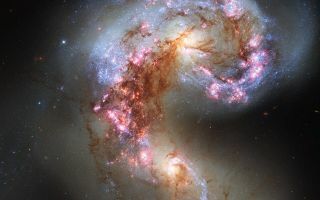 The rate of star formation is so high that the Antennae Galaxies are said to be in a state of starburst, a period in which all of the gas within the galaxies is being used to form stars. This cannot last forever and neither can the separate galaxies; eventually the nuclei will coalesce, and the galaxies will begin their retirement together as one large elliptical galaxy. This image uses visible and near-infrared observations from Hubble’s Wide Field Camera 3, along with some of the previously-released observations from Hubble’s Advanced Camera for Surveys.